The Daisy has held its importance in wedding ceremonies since ancient times, symbolizing loyal and everlasting love. This Daisy is plush with no distinct center and holds multiple blooms per stem. Our assorted Cushion Daisies make a beautiful bouquet alone, or as an accent to your wedding arrangements. Get a fresh delivery of Cusion Daisies shipped to your doorstep. We are a wholesale florist that sells quality flowers to the general public and businesses. Our flowers are perfect for do-it-yourself weddings, decorating for events, fundraisers or holiday parties. We offer the Lowest Prices on fresh flowers for strict budgets. Our flowers come directly from the grower, which ensures you will get the best prices for your flowers. 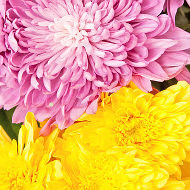 Buying our bulk florals ensures you will get the freshest blooms and will save you money. We can deliver bulk flowers to almost anywhere in Canada. For deliveries to remote areas please contact us before placing an order. We can deliver wholesale flowers to Ontario, Quebec, British Columbia, Alberta, Manitoba, askatchewan, New Brunswick, Nova Scotia and Prince Edward Island. We do not deliver to Newfoundland, Labrador, Nunavut, Northwest Territories and the Yukon.